In diving there’s no room for mistakes. Knives have always been essential gear for underwater work, whether you’re down there for fun or for business. Divers need knives that won’t dissolve away in salt water and perform equally well in either everyday tasks or emergencies. When seconds mean life or death, buyers prefer knives which don’t fail. Arriving at the perfect diving knife design isn’t easy. Weight isn’t such a factor in an environment where handle materials buoy the blade and people wear weight belts anyway. Efficiency and reliability do count. 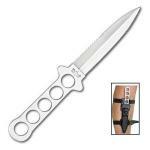 In diving knives you’ll find some of the most impressive and most garish modern working blades. Synthetic handle materials — often brightly colored — offer a secure grip and a last chance recovery if dropped. Exotic metals may substitute for the dependable stainless steel most can more easily afford. While a sport diver might be more concerned with redirecting the occasional shark or cutting free from entangling debris, professional divers working in extreme conditions depend on blades that do it all — cut, stab, pry and even saw through cable. Tailoring the knife to your own level of involvement in the trade is sensible, but don’t skimp. Our pick for the best diving knife is the U.S. Divers Titanium Diver’s Knife. It has the essential features that a reliable diving blade should have, but in lightweight corrosion resistant titanium — better than stainless steel. Easier on the budget, the DiveMaster Diving Knife shows a similar array of special features with a blade of high carbon stainless steel. 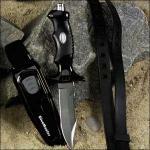 The Kershaw Amphibian Dive Knife is probably the least you should carry. This stainless steel bargain is still a very capable but lightweight blade. Think cutting instead of hammering and prying. Not many knives get as much public product testing as this Promate Titanium Diving Knife. Watch the survival episodes Bear Grylls filmed in Costa Rica and the Pacific Islands, and you'll see this rugged knife put to hard use. 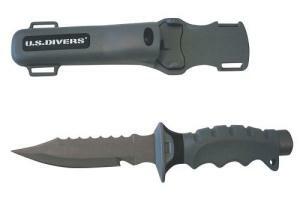 The Underwater Kinetics Fusilier is a dive knife for those divers who don't wish to carry actual knives. That seems like a strange idea, but there are reasons this knife might appeal to other more broad-minded divers as well. 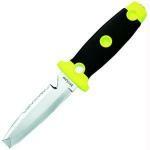 This Kershaw Amphibian water sports knife is a bold statement. It's an attractive knife, with a serious and stealthy design, one sure to get some attention from fellow divers and kayakers. 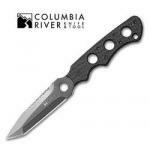 I have mixed feelings about this Schrade Water Rat dive knife. Here's a bigger, badder Barracuda! OK, it's technically not any bigger in size than the stainless steel Barracuda by ProMate, but it's much stronger, and boasts a higher quality than its sibling. 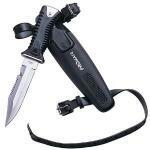 This is a less expensive titanium knife from ProMate, called the Seal. 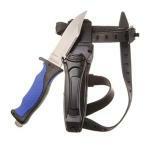 It's less expensive because it's from a low-profile maker and it's a folding knife. While this may not be the strongest or sturdiest diving knife available, it's certainly not a bad deal, or a bad product for that matter. The Barracuda would be an acceptable choice to carry with you on your next scuba excursion, no question. 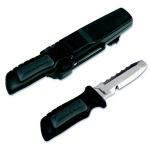 This is a pretty slick diving knife from Underwater Kinetics (or "UK" as they're known to those in the know). 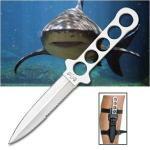 Diver's knives should be rugged, lightweight, corrosion-resistant and versatile. This knife is all four. Check out the picture of this one. That's a mean looking shark back there. If you're going to come face to face with a shark, make sure you get a good knife, okay? And if you're going to spend this much on a diver's knife, you'd better make sure you're getting what you pay for.